From the developer of zombie shooter comes a sequel to Alien Shooter. Alien shooter 2 continues the horror of alien teleportation. This Sigma team game adopts a topdown shooter perspective with a tinge of RPG elements in it. The portals to another dimension are again opened. This time, Magma corporation was behind the experiment. They plan to transport the aliens through the portal and control them. However, they were overwhelmed by the number of human-killing aliens transported. Eventually, all the people within the facility were killed by the aliens. General Baker and his squad were sent into the facility and you were called in to assist the fight against the aliens. This story-line may be similar to Alien shooter but the action in this game is definitely doubled as Sigma team puts action in its games above everything else. 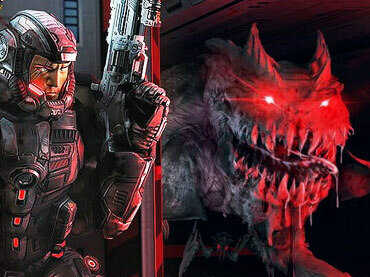 Similar to alien shooter vengeance, the main objective of the game is to survive the hordes of relentless alien monster charging at you. In the process, you will have to clear the different monstrous creature within the level. In this particular action and RPG game, you will have different mission based objectives within the level. Complete these missions one after another before advancing to the next level. With aliens coming to you at all direction, survival becomes your main priority of the game. You begin this shooting game with a low-level pistol with a large amount of ammunition. In your first level, you will encounter a significant number of weak bugs. As you proceed with the game you will find distinct differences that separate Alien shooter 2 from its predecessors. Within this arcade, action and RPG packed game, there is an additional level up system where you get the authority to pump on your hero’s attribute. Giving you the room for character development and personalisation. Another distinct difference in this large-scale sequel is the choice of learning a special ability during the start of the game. This may give you an added advantage in the early game depending on your choice. Although most of the offers don't give you immediate gratification, there are abilities that will come in handy in your early game. Police cars were also added as a vehicle for you, spicing up the arcade action in this online game. For players who think that sigma's pc games were manageable, Sigma has also made modifications to their classical games.There is an additional difficulty mode that was added to this sequel. The “impossible” mode. There were more weapons added in alien shooter 2. In Alien shooter, there is a limited choice of 9 weapons. However, this number quadrupled to 50 over weapons that you can choose from throughout your gameplay. Unlike all the other PC games with only one campaign mode, alien shooter 2 offers you two new additional survival modes: stand firm and gun stand, on top of the typical campaign mode. I will not explain the campaign mode in much detail as this is quite similar to its predecessor. Stand firm is not really new but a redesign of the survival mode. In this mode, you will have to keep yourself safe while killing as many enemies as you can. At the end of each enemy wave, you will fight the boss. When the boss is defeated, it will drop 5 advance weapon. Like the other classical games of sigma team, equipment and power-ups are made available to you upon slaying the enemy. The final mode is the Gun stand. In this mode, you control a turret filled with ammunition. Where you must feed off the waves of enemies. With every wave completed, a blast will be triggered to kill all remaining enemies. After looking at Alien shooter 2 's graphics, it looks as though someone had made a 3D model of the sprite images. It keeps the classic bird eye isometric view where players are topdown shooter approach. The music plays according to the mood of the game. It becomes really intense when you are charged by a massive number of aliens. The older enemies were redesigned which really blends into the new graphics. The redesign has had the game embellished with a refined game. Overall there is an improvement in the graphics and sound effect. Just when you are trapped on a certain level, there is always some cheats that you could use to assist you After multiple tries, it can be really frustrating to be stuck on a level. Below are Top 10 most popular cheat codes that may be useful for you. Use it sparingly, only when you need it. Remove gamma from level - "remgamma". In conclusion Alien shooter 2 is definitely a great sequel to Alien Shooter. With the redesigning of the different game modes and the addition of a wide spectrum of weapons, Sigma team has successfully turned up the action in this sequel. Although some may argue that some missions in Alien Shooter 2 are a little draggy, the action did compensate for the long mission. There is also a save file option that doesn't take up much video memory. If you are an action game lover, you will have a lot of fun in this shooting game expansion. It is now made free for download. If you have questions about Alien Shooter 2 game, please contact us using this form.